Will a little tutorial help jumpstart your week? Maria Petkova has been refining what she calls her Painted with Mokume Gane technique. The painted look of this Violets on My Window Sill pendant shows the appealing backfilling technique that simulates hand drawing on polymer. She shows an entire gallery of examples on her website. Here’s her latest free step-by-step tutorial that shows the process quite clearly. Her earlier tutorial was intruiging but harder to follow. 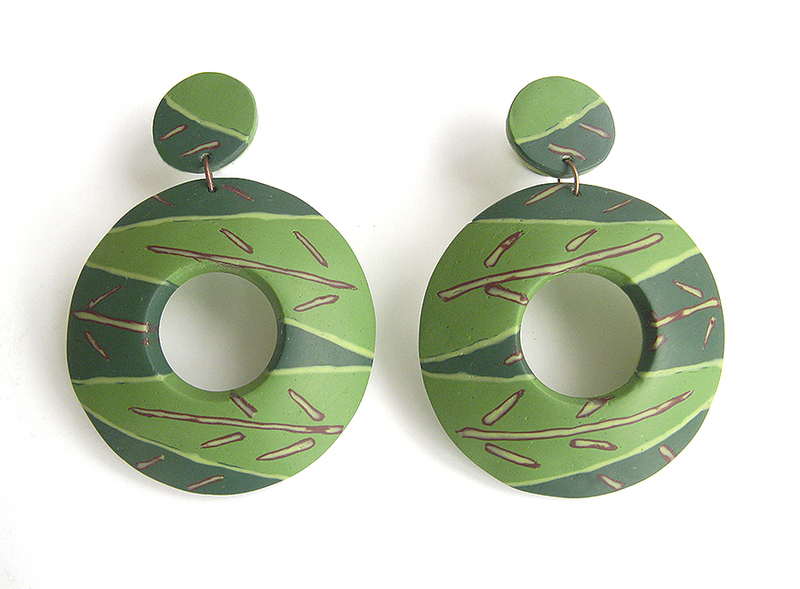 In these In the Jungle earrings Maria takes the technique to a higher level of refinement. She pushed herself to create them as she was completing her How To Become A Better Artist course with Christine Dumont on Voila. Thanks so much for the tutorial! Very interesting, never seen that technique before! I love this new interesting technique! It’s the nice simplicity of her pendants that make them stand out. I would have never thought about painting with mokume gane. Thanks for sharing this with us! Thank you so much Cynthia!I`m very thankful to Christine Dumont for her support and guidance and for the inspiring course!